Push the right button the first time around. This is the only remote control that automatically lights up as you bring your hand nearby, so you’ll always know exactly which button to press, even in the dark. 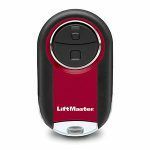 LiftMaster® offers replacement remote controls for many of our older garage door openers. To find out which one will work with your system, please visit the Accessory Compatibility page in the LiftMaster site.